Carry a stylish statement with you wherever you go! 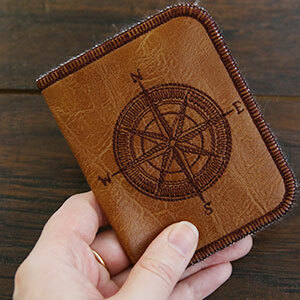 This in-the-hoop wallet design features a decorative compass rose motif, perfect for the wanderer at heart. 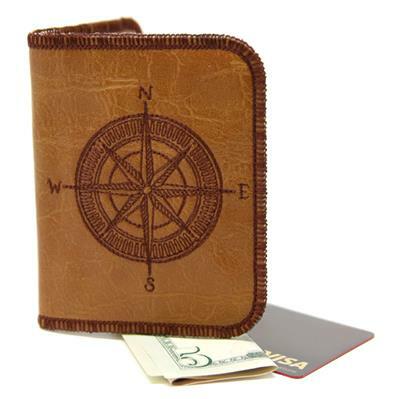 Your choice of outer and lining fabrics will make your wallet one-of-a-kind! First, print the dieline files that comes with your design. This file will always have "DL" in the name. 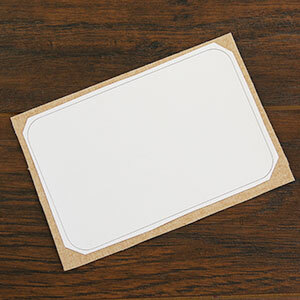 (Click here for instructions on how to print or stitch dieline templates.) The Wanderlust Wallet design we are using has four files - one is the full embroidery file, and the other three are dieline files. 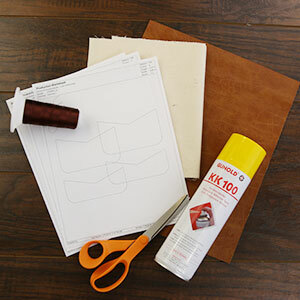 Spray the back side of the paper with temporary adhesive and smooth it onto the wrong side of the pleather or leather. Placing it on the wrong side of the fabric will prevent the sticky residue from building up on the right side of the pleather or leather. Cut around the shape, and repeat to cut out all the other dieline piece. Make sure to cut out the front, back (lining), and all four pockets. 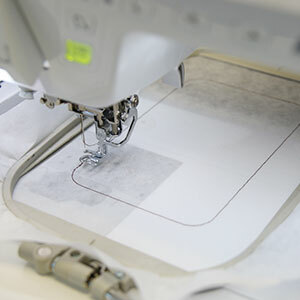 Hoop a piece of tearaway stabilizer, and load the embroidery file (not a dieline file) onto the machine. 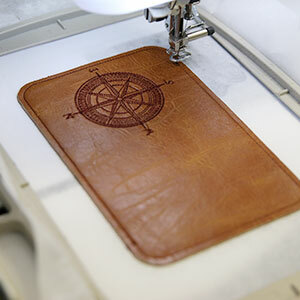 The first thing to embroider is the dieline which shows you where to place the front pleather piece. 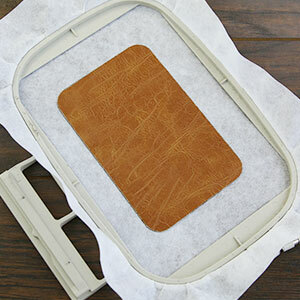 Spray the back side of the front pleather piece with temporary adhesive, and carefully smooth it in place within the shape. Then continue to embroidery the tackdown for the front piece. Then continue to embroider all the internal details, and follow the color change sheet. Make sure to stop before sewing the "back piece tackdown" step. 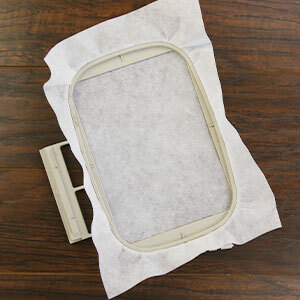 Before sewing the "back piece tackdown" step, remove the hoop from the machine, and flip it over so the back side is facing up. Then spray the back side of the back piece with temporary adhesive, and smooth it in place over the back side of the embroidery. 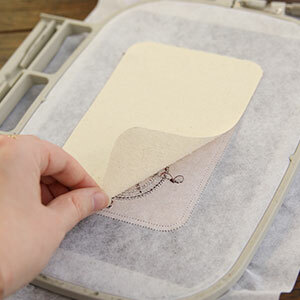 Place the hoop back onto the machine and embroider the "back piece tackdown" step. Stop the machine again before sewing the "pocket tackdown". 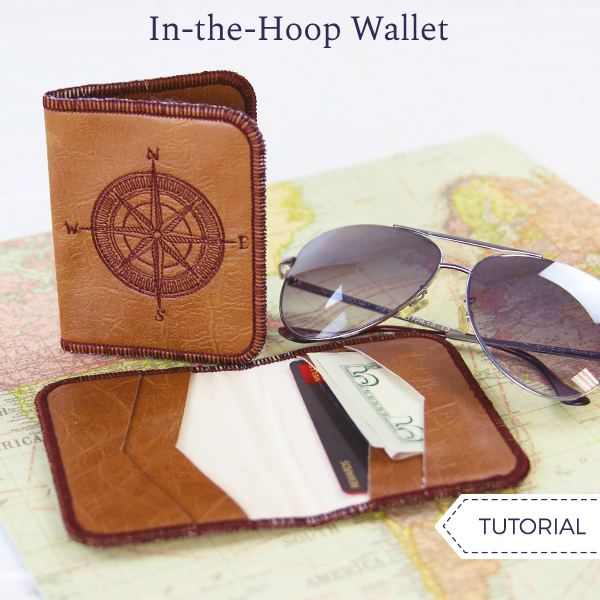 The in-the-hoop leather wallet has four pockets. Turn the hoop over again, so the back side is facing up. 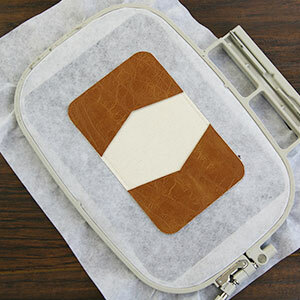 Then spray the back side of the two large pocket pieces with temporary adhesive. For best results, only spray along the 3 straight sides. Place them over the back fabric, lining the edges up with the original dieline on both ends of the wallet, and smooth them in place. .
Then repeat to spray along the edges of the smaller pockets and place them directly on top of the larger pockets. 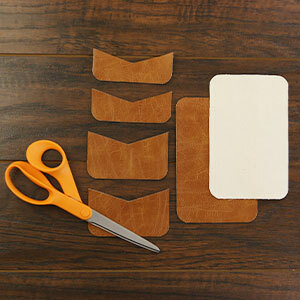 Make sure to match up the edges and smooth them securely in place. 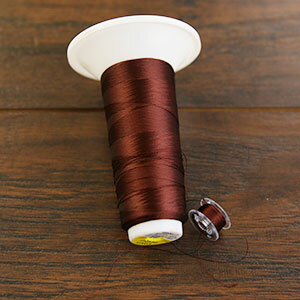 Before embroidering the rest of the design, wind a bobbin to match the thread being used in the top needle. 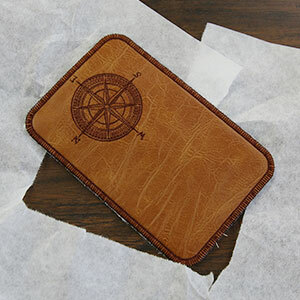 This way the stitching will look nice and uniform on the inside and outside of the wallet. 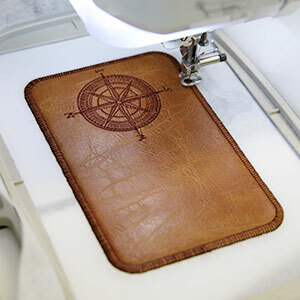 Place the matching bobbin into the machine, and embroider the final two steps of the design. First a "pocket tackdown" will embroider to secure the pieces in place. 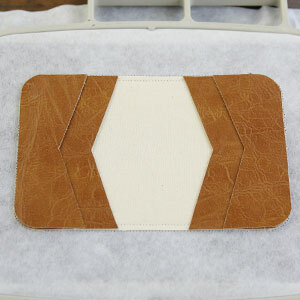 Then the finishing seam will sew the final border around the wallet. 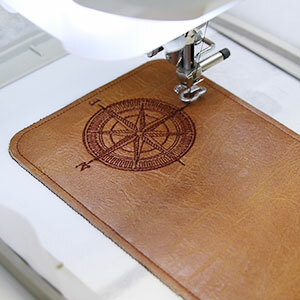 Once the wallet has finished embroidering, remove the stabilizer from the hoop, and then gently tear away the excess stabilizer from around the design. To finish the in-the-hoop wallet, match up the short ends and fold the wallet in half, carefully creasing the fold with a bone folder or the side of a pencil or marker.